Ailish Forfar wore her older brother’s hand-me-down hockey equipment the first time she was ever on ice. She was learning to skate at a tiny arena in Sutton, Ont., waddling from end to end, when she dropped her stick. She bent down to pick it up and found that she couldn’t. Her brother’s gloves were too big. She knew her parents were watching, standing against the glass because there weren’t any stands at the arena and, like many three-year-olds would, she started crying. Of course, the former Ryerson Rams women’s hockey captain has a much steadier grip today; that moment was 21 years ago and she now has gloves that fit. Today, Forfar skates in much bigger arenas as a member of the Markham Thunder in the Canadian Women’s Hockey League (CWHL). And Sophia said the same thing to her daughter on the day of the third-year RTA student’s first CWHL game on Oct. 13. Forfar interrupted her. She’d heard this spiel hundreds of times. Regardless of the interjection, Sophia finished her speech. Hours after they hung up, Forfar’s parents were in the stands watching as she scored her first goal in her first ever CWHL game. Though she’s fitting in nicely with the Thunder, Forfar says she still misses playing with the Ryerson Rams. The 2017-18 season was her last year playing hockey at the university level. According to Canadian U Sports’ guidelines, athletes are only eligible to play at universities for five years. Before coming to Ryerson, Forfar graduated from Dartmouth in New Hampshire where she played for three seasons, which only gave her two years of hockey with the Rams. “I miss coming out into the Mattamy Athletic Centre and seeing our fans. This rink is amazing and being able to play here is really special,” she said. The story continues after the infographic about Forfar’s time playing with the Rams. But she doesn’t have to miss her old teammates too much. Forfar signed on to be an assistant coach at the end of her last season. Forfar has class three days a week and she’s able to make it to four out of the five Rams’ weekly practices. The Thunder plays at least one game every weekend and they practise Tuesday and Thursday nights. 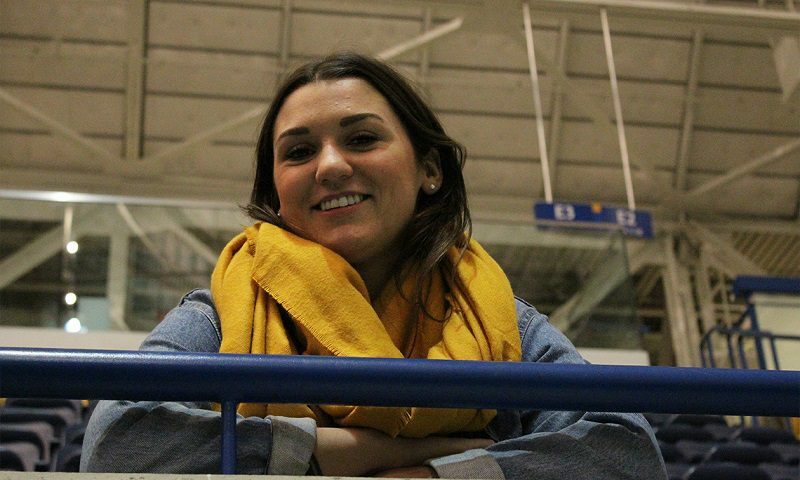 Oh, and she’s also organizing this year’s humanitarian trip for Ryerson’s athletes. Somehow, Forfar has never missed a practice with the Thunder. “[I’m definitely] much busier this year. I make it work … but there’s times where I’m a little overwhelmed,” she said with a laugh. Originally, Forfar didn’t want to play in the CWHL while still holding a position with the Rams. Forfar wasn’t going to be able to say no to the CWHL. She took time to make the decision, but once she found out the Thunder wanted to sign her, she knew she just wasn’t ready to hang up her skates. Even though she’s still playing for one team, she finds it difficult to stay on the sidelines as an assistant coach during Rams games. As the Rams’ former first line centre, Forfar is used to being on the ice for big moments in the game. As she makes the transition from Rams captain to a rookie on the Thunder, she’s working on rediscovering her role on a new team in a new league. Forfar has played on all four lines with the Thunder thus far as she tries to find her place. But no matter where she ends up playing, she is at least going to try to bring a little lightning to the Thunder. Though everything else may be different for her, one thing remains the same: Forfar is always going to be a captain at heart. That, and if she drops her stick, she’s always going to be able to pick it up.